EU regional policy is one of the most important programmes in the world that tries to stimulate growth in lagging-behind areas. It accounts for a significant proportion of the EU budget (27%, or €277 billion, in the 2007-2013 programming period) and mainly focuses on regions (NUTS II) whose GDP per capita is less than 75% of the EU average (Objective 1 regions, renamed Convergence regions in 2007-2013). Expenditures include both investments (transport or telecommunications infrastructures, outlays for innovation, energy, the environment) and labour market programmes (aimed at reducing unemployment and increasing skills and social integration). Is the money spent on regional policy worth it? Recently, credible causal estimates have pointed out the effectiveness of the Objective 1 programme in spurring GDP growth in European regions (Becker et al. 2010, Pellegrini et al. 2013), even though a high level of regional heterogeneity prevails (Becker et al. 2012). While these findings are very relevant, one can argue that they are not sufficient for supporting EU regional policies. Transfers may have positive effects on local economies during the years of funding (when the ‘party is happening’), without triggering a self-sustaining higher growth path (which can be evaluated only when the ‘party is over’). The key question is then whether the intervention can deliver self-sustaining growth? Recently, the World Bank underlined this issue by distinguishing between ‘treatment’ and ‘cure’: “A treatment is an instance of treating someone, say, medically. A cure ends a problem. Sometimes, the treatment is a cure. Other times, it just keeps the problem under control without curing it: if you remove the treatment, the problem comes back” (World Bank 2014). In a recent paper, we analyse what happens when the treatment is terminated (Barone et al. 2016). That is, we evaluate whether the EU policy represents a case in which the treatment is the cure. The paper documents what happened in the Italian Southern region of Abruzzi, which after being treated under the Objective 1 programme for a period of time (1989-1996, but with the actual supply of funds ending in 2000), exited the programme without any transitional support (what is now known as phasing-out). We compare the GDP per capita in Abruzzi after the flow of funds lapsed (in 2001) with those which would have been observed had the treatment continued. The counterfactual pattern is estimated with the synthetic control method proposed by Abadie and Gardeazabal (2003) and Abadie et al. (2010). To be sure, Abruzzi is compared with a weighted combination of Italian Southern regions that were included in the Objective 1 programme for the whole 1989-2008 period (in the jargon of the synthetic control method, the Synthetic Abruzzi). 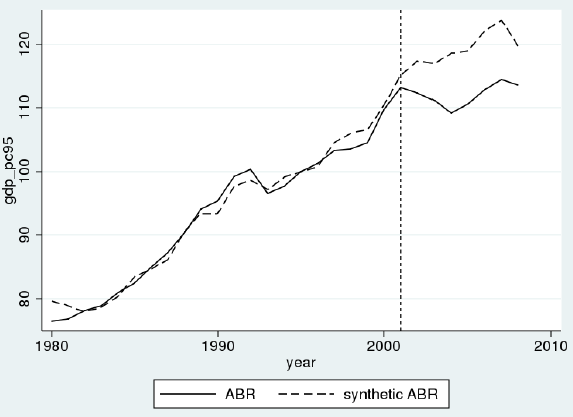 Figure 1 shows that the Synthetic Abruzzi traces almost exactly the economic performance of true Abruzzi in the 1980-2000 period. From 2001 onward the two lines diverge, with Abruzzi growing at a slower pace than its counterfactual pattern. At the end of the estimation period (2008) Abruzzi experienced a 5.5% drop in per capita GDP compared to the Synthetic Abruzzi because of losing the Objective 1 support. Notes: The graph reports the GDP per capita in real terms (1995=100) of the treated region (Abruzzi) and of the synthetic control. The weights used to build the synthetic controls are 0.641 (Molise), 0.200 (Campania) and 0.159 (Calabria). Our estimated loss (0.8% on an annual basis) is only partly informative about the overall benefits of the intervention. Assume that the policy has two effects: a contemporaneous one (that vanishes if funds are withdrawn) and a permanent one (that remains even without financial aid). For instance, consider an investment in a new road that increases the value added for the same year it is built and at the same time permanently improves mobility. Our empirical exercise estimates only the former effect because the synthetic control is made up of regions that continue to receive the treatment – the possible permanent effect is shared by treated and control regions. To shed light on the total gains and losses, we compare our estimate with those prevailing in the literature on the overall effect (i.e. the contemporaneous impact and permanent component) of the policy. This comparison highlights that the overall gains are likely to be of an order of magnitude very close to the loss we estimate with reference only to the contemporaneous impact for the period, when the party is over. This indicates that the loss that we quantify erodes all the previous gains. Our findings, derived from the case of a single region, suggest that the treatment has not been the cure and the Objective 1 programme could be a remedy for economic underdevelopment, so long as the funding does not end. This means that support for the programme could come more from a redistributive argument than from the idea that it will stimulate endogenous growth. On methodological grounds, our results suggest that looking at what happens when the financing terminates should be an essential part of thoughtful evaluations. Finally, it is important to note that the conclusions derived from our investigation – which, again, refer to one region only – might have a very low external validity. Therefore, using the case of Abruzzi to draw conclusions about potential consequences on other regions of the termination of their EU financing is not warranted. Authors’ note: The views expressed in this column are those of the authors and do not necessarily correspond to those of the Institution they are affiliated with. Barone, G, F David, and G de Blasio (2016), “Boulevard of broken dreams. The end of EU funding (1997: Abruzzi, Italy)”, Regional Science and Urban Economics 60, 31-38. Becker, S O, P H Egger, and M von Ehrlich (2010), “Going NUTS: The effect of EU Structural Funds on regional performance”, Journal of Public Economics 94, 578-590. Becker, S O, P H Egger, and M von Ehrlich (2012), “Too much of a good thing? On the growth effects of the EU’s regional policy”, European Economic Review 56, 648-668. Pellegrini, G, F Terribile, O Tarola, T Muccigrosso, and F Busillo (2013), “Measuring the Effects of European Regional Policy on Economic Growth: A Regression Discontinuity Approach”, Papers in Regional Science 92(1), 217-233. World Bank (2014), “Confusing a treatment for a cure”, Development Impact blog, 6 August.